Upon starting, Inkscape normally creates a new blank drawing using the default template. This template can be changed by editing or replacing the file inkscape/templates/default.svg; see the section called “Custom Templates” in Chapter 24, Customization. Depending on how your operating system is set up, a preexisting Inkscape drawing may be opened by clicking on the drawing's icon or by giving the drawing's filename as a command-line argument. Drawings in other formats may be opened the same way if Inkscape supports the format. The supported formats are the same as those that can be imported into an existing drawing (see the section called “Importing Files” in this chapter for a list). File → New (Ctrl+N): Create a new drawing after Inkscape has been started using the default template. Clicking on the icon in the Command Bar is an alternative way to access this command. File → New From Template... (Ctrl+Alt+N): Create a new drawing after Inkscape has been started using a template. Some templates include options to choose a particular size or allow customization. Each template has a default scale. Templates typically set the initial user unit equal to the unit used to define the page dimensions, thus a template with a width of 210mm (A4 size) will have an initial user unit equal to 1mm when the drawing is rendered at its nominal size. Normally you do not need to worry about the internal scale but there are some cases where it does have a noticeable effect. Having an appropriate scale helps to avoid small rounding errors where a dimension is stored in the SVG file as 0.99999999 instead of 1. Filter Effects (like blur) are defined in terms of the user unit so they will look quite different, for example, in inch dimensioned templates where one user unit is equal to one inch. The internal scale can be set on the Page tab of the Document Properties dialog. You can also add your own customized templates to your template directory. See the section called “Custom Templates” in Chapter 24, Customization. File → Open... (Ctrl+O): Open an existing file. Multiple files can be opened at the same time by using Shift+Left Mouse Click to select more than one file from the file opening dialog. This command can also be used to create a new Inkscape drawing from a file with a non-Inkscape format. The file types that can be opened are the same as those listed in the Importing Files section. 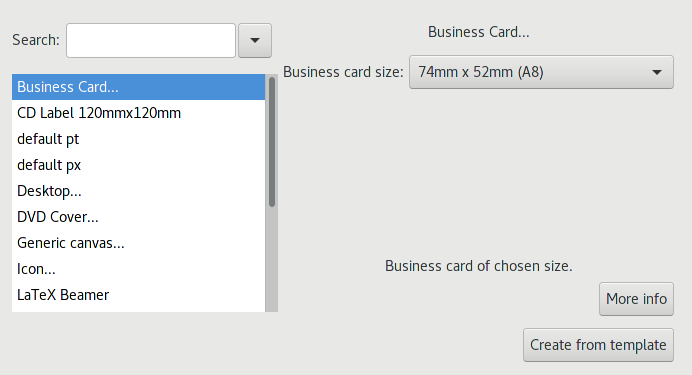 Previous to version 0.92, Inkscape defined an inch to be equal to 90 user units. Version 0.92 changes this to match the current SVG specification which, following CSS, defines an inch to be equal to 96 user units. All other absolute units ("mm", "cm", "pc", and "pt") are defined in terms of inches so they too are effected by this change. This file contains digital artwork for screen display. This choice is appropriate for pixel based artwork. The only change to the file will be that the internal representations of Grids that use absolute units ("mm", etc.) will be converted to user units (they will still be shown in the GUI with the selected Grid unit). The appearance of elements ... is most important. This option adds an SVG viewBox attribute to the document that sets scale such that the length of the initial user unit to be equal to 90 per inch relative to the external dimensions. Note that if absolute units are used internally in the document they will be interpreted according to the definition of one inch equals 96 user units (at the current scale taking into account transforms). This is only a problem if you wish to hand edit the file and use absolute units internally or are using the drawing as input to software that does not understand the SVG viewBox attribute. The accuracy of the physical unit size ... is most important. This option attempts to recursively scale all internal dimensions to account for the change in definition of the user unit relative to inches, keeping the initial user unit equal to 96 per inch relative to the external dimensions. Getting all the scaling correct is quite difficult and thus this option should be used only if you need to use absolute units internally or are using the drawing as input to software that does not understand the SVG viewBox attribute. The Open dialog includes a folder of Inkscape example drawings under the entry examples. File → Open Recent: Open a recently used file. Choose file from list in submenu. The Recent menu list may include system-wide recently used files. This list can be cleared in the Interface section of the Inkscape Preferences dialog. Hovering the cursor over a filename will show the entire path to the file. File → Revert: Revert a file to remove all changes made in the current Inkscape session.